In the right side of the In the right side of the shield (in the heraldic shield, right and left are exchanged from the observer point of view since we have to consider the right and the left of the soldier who, in ancient time, holds his own shield) we find represented the Coat of Arms of the Diocese of Las Vegas composed of four main sections. The first and main section of the design is gold (Or) to reflect the arid desert region of the Southwestern United States and, in particular, Nevada, which makes up most of the diocese. This field is surrounded by a blue (Azure) indented chief which gives symbolic representation to the many mountains in the landscape under the deep blue western sky. The third portion is the blue and silver (Azure and Argent) wavy bars at the base of the design; they honor the Colorado River whose waters are such a significant part of the region. Finally, at the center of the design is a Joshua Tree, technically known as the Yucca Brevifolia, which is indigenous to the area. This particular type of yucca tree is called the Joshua Tree because of the sword shaped leaves, on outstretched limbs, recalling the posture of the prophet Joshua as he pointed his spear at the city of Ai, as recorded in the old testament (Joshua 8:18)." 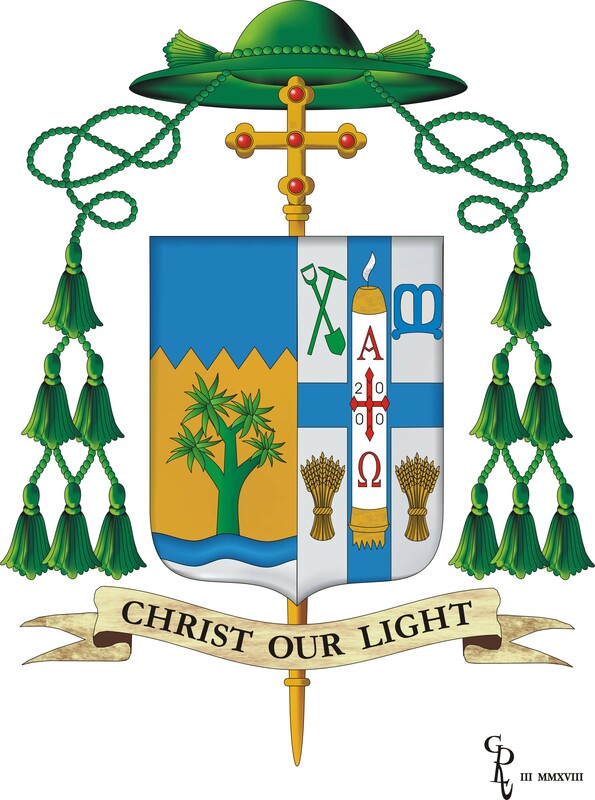 For his For his personal arms, seen in the sinister impalement (right side) of the shield, His Excellency, Bishop Thomas, has retained the design that was adopted to reflect his life and heritage as a priest and as a bishop as he was called to serve as an Auxiliary Bishop for the Archdiocese of Seattle before, as Bishop of Helena then and as Bishop of Las Vegas now. On a silver (Argent) field is placed a blue cross that contains the central symbol of the theme of the design that is additionally carried forward by Bishop Thomas’ episcopal motto, a paschal candle. After the kindling of the fire during the Easter Vigil Service, as the deacon carries the newly lighted paschal candle into the darkened church, as a symbol of resurrected Christ, he intones, three times, the phrase that His Excellency, Bishop Thomas has selected for the motto of his episcopacy: “CHRIST OUR LIGHT.” This light, as seen throughout the liturgical season of Eastertime and which is given to each newly baptized person, and is also seen during the rituals of Christian burial, is symbolic of the fact that the Light of the salvation of the Risen Christ that is in each Catholic is carried from birth to death as the sustaining beacon on each person’s life journey. It is He, Christ, who is this light. That is the guiding force for Bishop Thomas as he ministers to God’s Holy People in the fullness of the priesthood as a bishop. Within the quarters of the shield that are created by The Cross are a green (Vert) crossed pick and shovel to honor the Irish heritage of The Bishop’s mother, Mary Rita (Cronin) Thomas, whose family were miners in County Cork, Ireland and then in Michigan and Montana. There are also two garbs of wheat, that are blazoned as “Proper,” that is, “as they appear in nature,” to signify that the family of the Bishop’s father, also George Leo Thomas, were farmers and there are two of them to honor His Excellency’s baptismal patron, Thomas, whose name means “twin.” The final charge in the design is a Keltic “M,” in blue, to honor the Blessed Virgin Mary, in her title of Our Lady of Perpetual Help. This charge is used to signify that it is Mary that sustains the life of every cleric in The Church, particularly by always being there, as our “Other Mother,” to be the guide that we each need to follow the Light of Christ as we are called to do.